The IF4 is a simple reader or “peripheral device”, with best in class dense reader mode performance, specifically designed with a RS232 port for a cost effective solution for implementing RFID by attaching the reader to a programmable logic controller (PLC). The IF4 is a simple reader or “peripheral device”, with best in class dense reader mode performance, specifically designed with a RS232 port for a cost effective solution for implementing RFID by attaching the reader to a programmable logic controller (PLC). When identifying relatively small numbers of items at a time, such as boxes traveling on multiple conveyor belts, cost savings can be achieved by deploying a single IF4 reader with four antennas instead of installing four separate readers with one antenna each. 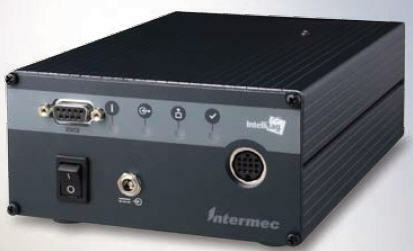 The Intermec IF4 serial reader is the ideal RFID peripheral for applica¬tions where an edge server or Program¬mable Logic Controller (PLC) is used for process control. The IF4 reduces the com¬munications burden on the network and processing demand on the host PLC. While reading and writing RFID labels and tags, the IF4 uses an air-interface protocol for filtering out unneeded tag data caused by multiple reads and tags not required for the application. General purpose input/output (I/O) circuitry enables the IF4 to monitor and/or control peripheral devices while keeping the cost of ancillary equipment and instal¬lation down. After the IF4 controls the selection of appropriate tags for reading, it then combines its pre-configured application parameters with the information from the selected tags in order to activate external sensors as well as control audible and visual indicators.